Long-Acting Anti-MRSA Agents: One Dose to Cure? Methicillin-resistant Staphylococcus aureus (MRSA) is a significant cause of both health care–associated and community-associated infections.1 The most common types of infections caused by MRSA are skin and soft-tissue infections, bacteremia, infective endocarditis, pneumonia, and osteomyelitis.2 Per current guidelines, oral antimicrobials for the treatment of mild-to-moderate MRSA skin infections include trimethoprim/ sulfamethoxazole, clindamycin, doxycycline, minocycline, and linezolid.1 Alternatively, vancomycin tends to be the most common intravenous (IV) agent for empiric coverage of a potentially serious MRSA infection.1 Serious infections caused by MRSA have a high morbidity and mortality, with estimates for mortality as high as 30% to 37% with endocarditis.1 Treatment durations for MRSA infections can vary widely based on the site and source of infection.1 Because of growing resistance and the need for a single-dose treatment option to help patients avoid hospitalization, facilitate their earlier discharge, or eliminate their need for continued outpatient parenteral antimicrobial therapy (OPAT), long-acting anti-MRSA agents have been developed. 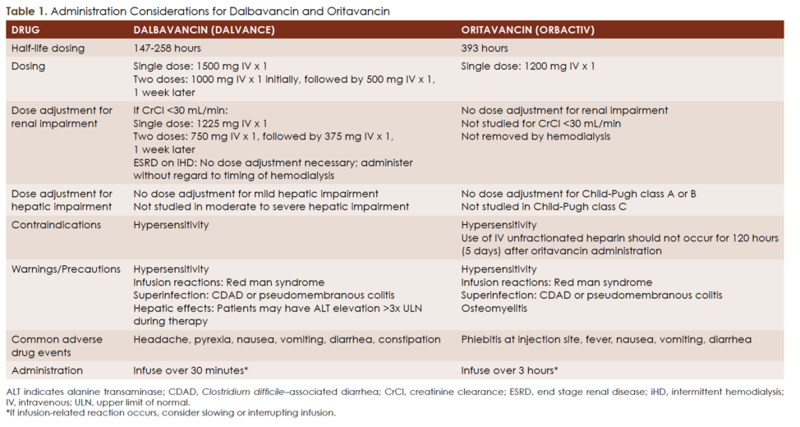 The cited clinical scenarios of use for oritavancin and dalbavancin include patients seen in the emergency department (ED) who do not require hospital monitoring; completion of inpatient therapy to allow for earlier hospital discharge; patients in whom medical compliance would be an issue; and certain parenteral home-therapy cases.7 These potential therapeutic niches have been explored via cross-sectional studies and meta-analysis. Regardless of the great potential these agents can provide, the ultimate future of oritavancin and dalbavancin is yet to be determined. Both the pharmacokinetics and the convenient 1-time dosing of these drugs make them alluring options for the treatment of gram-positive infections that otherwise require prolonged courses of antibiotics, such as osteomyelitis, endocarditis, and even bacteremia. However, recent literature searches mostly yield case reports of these drugs being used as alternative therapy for infections. Dalbavancin has been compared with vancomycin in the setting of catheter-related bloodstream infections. A phase 2, open-label, randomized, controlled, multicenter study compared dalbavancin 1000 mg followed by 500 mg 1 week later with vancomycin administered twice daily for 14 days; the results indicated that the success rate of dalbavancin at 87% was significantly higher than that of vancomycin at 50%. Most frequently isolated bacteria were Staphylococcus spp., including coagulase-negative Staphylococcus and MRSA.16 Studies assessing dalbavancin’s role in osteomyelitis treatment are currently ongoing (NCT03426761; NCT02685033). In conclusion, dalbavancin and oritavancin are promising novel agents for the treatment of gram-positive organisms. Although they are currently FDA approved only for the treatment of ABSSIs, they have potential use in the treatment of other infections, such as osteomyelitis and endocarditis. 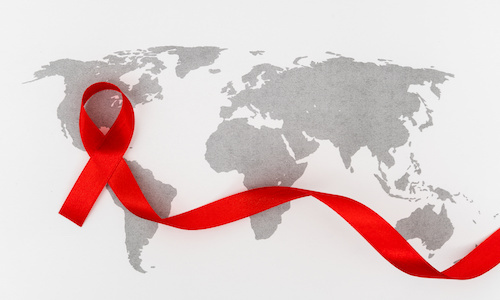 However, further studies, including randomized controlled trials, are still needed. Dr. Monogue received a PharmD from the University of Texas at Austin College of Pharmacy, in Austin, Texas, and postgraduate training at Parkland Health and Hospital System (PGY-1) and the Center for Antiinfective Research and Development at Hartford Hospital (Infectious Diseases Fellowship). She is an active member of SIDP. Drs. De Souza, Kent, and Mootz, are PGY-1 pharmacy practice residents at the University of Texas Southwestern Medical Center in Dallas, Texas, where Dr. Monogue is an infectious diseases and antimicrobial stewardship pharmacy specialist. Liu C, Bayer A, Cosgrove SE, et al; Infectious Diseases Society of America. Clinical practice guidelines by the Infectious Diseases Society of America for the treatment of methicillin-resistant Staphylococcus aureus infections in adults and children [published correction appears in Clin Infect Dis. 2011;53(3):319]. Clin Infect Dis. 2011;52(3):e18-e55. doi: 10.1093/cid/ciq146. Tong SY, Davis JS, Eichenberger E, Holland TL, Fowler VG Jr. Staphylococcus aureus infections: epidemiology, pathophysiology, clinical manifestations, and management. Clin Microbiol Rev. 2015;28(3):603-661. doi: 10.1128/CMR.00134-14. Zhanel GG, Calic D, Schweizer F, et al. New lipoglycopeptides: a comparative review of dalbavancin, oritavancin and telavancin. Drugs. 2010;70(7):859-886. doi: 10.2165/11534440-000000000-00000. Dalvance [prescribing information]. Parsippany, NJ: Durata Therapeutic U.S. Limited; 2018. Orbactiv [prescribing information]. Parsippany, NJ: The Medicines Company; 2018. Stanton M. Orbactiv and dalbavancin: one and done. Pharmacy Times website. pharmacytimes.com/contributor/matthew-stanton-pharmd-bcps/2016/03/orbactiv-and-dalbavancin-one-and-done. Published March 22, 2016. Accessed February 15, 2018. Chen AY, Zervoc MJ, Vazquez JA. Dalbavancin: a novel antimicrobial. Int J Clin Pract. 2007;61(5):853-863. Agarwal R, Bartsch SM, Kelly BJ, et al. Newer glycopeptide antibiotics for treatment of complicated skin and soft tissue infections: systematic review, network meta-analysis and cost analysis [published online September 4, 2017]. Clin Microbiol Infect. doi: 10.1016/j.cmi.2017.08.028. Burgess DR, Baum RA, Bailey A, Myint T, Wallace KL. Impact of an antimicrobial stewardship and emergency department initiated dalbavancin guideline for patients with acute bacterial skin and soft tissue infections. Open Forum Infect Dis. 2017;4(Suppl 1):S267. doi: 10.1093/ofid/ofx163.589. Koziatek C, Mohan S, Caspers C, Swaminathan A, Swartz J. Experience with dalbavancin for cellulitis in the emergency department and emergency observation unit [published online November 17, 2017]. Am J Emerg Med. doi: 10.1016/j.ajem.2017.11.037. Corey GR, Kabler H, Mehra P, et al; SOLO I Investigators. 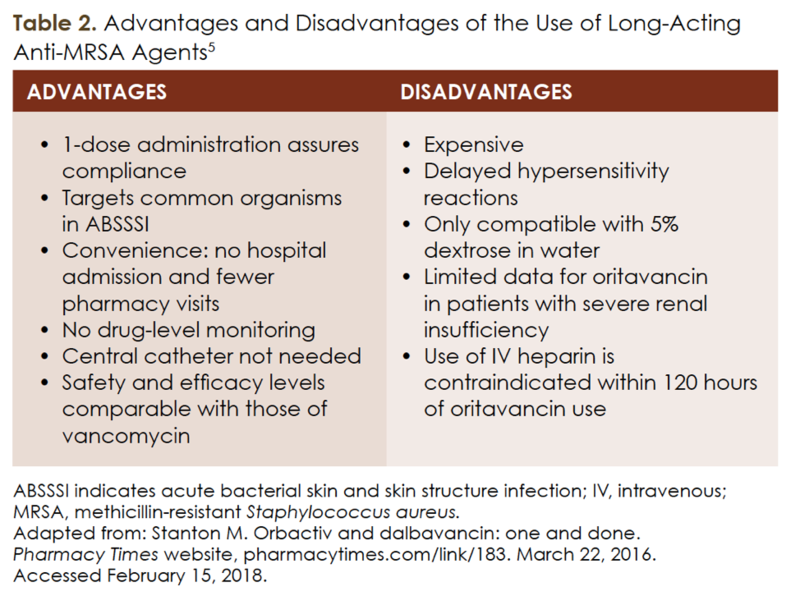 Single-dose oritavancin in the treatment of acute bacterial skin infections. N Engl J Med. 2014;370(23):2180-2190. doi: 10.1056/NEJMoa1310422. Corey GR, Good S, Jiang H, et al; SOLO II Investigators. Single-dose oritavancin versus 7-10 days of vancomycin in the treatment of gram-positive acute bacterial skin and skin structure infections: the SOLO II noninferiority study. Clin Infect Dis. 2015;60(2):254-262. doi: 10.1093/cid/ciu778. Delaportas DJ, Estrada SJ, Darmelio M. Successful treatment of methicillin susceptible Staphylococcus aureus osteomyelitis with oritavancin. Pharmacotherapy. 2017;37(8):e90-e92. doi: 10.1002/phar.1957. Stewart CL, Turner MS, Frens JJ, Snider CB, Smith JR. Real-world experience with oritavancin therapy in invasive gram-positive infections. Infect Dis Ther. 2017;6(2):277-289. doi: 10.1007/s40121-017-0156-z. Almangour TA, Fletcher V, Alessa M, Alhifany AA, Tabb D. Multiple weekly dalbavancin dosing for the treatment of native vertebral osteomyelitis caused by methicillin-resistant Staphylococcus aureus: a case report. Am J Case Rep. 2017;18:1315-1319. doi: 10.12659/AJCR.905930. Raad I, Darouiche R, Vazquez J, et al. Efficacy and safety of weekly dalbavancin therapy for catheter-bloodstream infection caused by gram-positive pathogens. Clin Infect Dis. 2005;40(3):374-380. Lane S, Johnston K, Sulham KA, et al. Identification of patient characteristics influencing setting of care decisions for patients with acute bacterial skin and skin structure infections: results of a discrete choice experiment. Clin Ther. 2016;38(3):531-544; quiz 544.e1-e9. doi: 10.1016/j.clinthera.2016.01.007. Datta R, McManus D, Topal J, Juthani-Mehta M. Long-acting lipoglycopeptides for gram-positive bacteremia at the end of life to facilitate hospice care: a report of 3 cases. Open Forum Infect Dis. 2018;5(1):ofx277. doi: 10.1093/ofid/ofx277.